Our devices are more connected than ever. The modern smart-home can everything from Wi-Fi enabled lightbulbs to Wi-Fi tea kettles. But as people continue to add devices to their network, they’re starting to discover a problem. When you have a network with only two devices connected, a smartphone and desktop computer, then just about any decent router will be able to accommodate your every need. When you expect to connect a dozen different devices, that’s when you need to be more deliberate in your selection. This is especially true when you layer-on bandwidth hungry activities like UHD video streaming. Your router is supposed to organize this chaos into a smoother experience, all the while protecting you from and endless array of online threats. But doing a good job organizing multiple devices with modern speeds? It’s more of a challenge than most people realize. When you’re choosing between two routers in the same series, the thing which distinguishes one router from the other is almost always bandwidth capacity. But it’s not that simple with the AX8 and AX12. 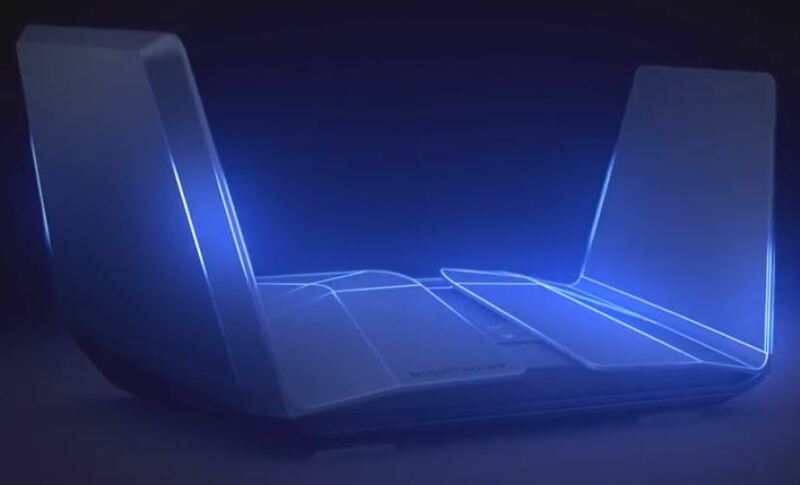 Naturally, being two routers of the same series, they share plenty of similarities. For instance, they both allow for nearly a dozen Wi-Fi streams, and are both well equipped for providing network signals to very large homes. But as the AX12 scaled-up its ability to handle traffic, developers also had to scale-up its infrastructure in other aspects of its design. As a result, the AX8 and AX12 and actually more distinct than their appearance lets on. From a purely physical standpoint, both the Nighthawk AX8 and AX12 look virtually identical. Both measure about 12.2 x 2.8 x 1.2-inches, and weigh close to three pounds. Both have a U-shape design, and are made with the same black polymer chassis. 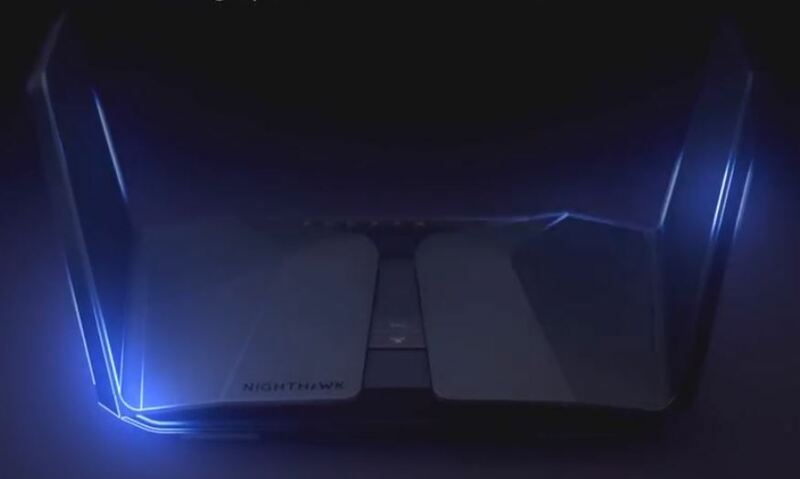 Along the edges of this U-shape, there are fairly bright LEDs, which give the Nighthawk a minor presence within a room. Though both routers provide an LED on/off button, just in case you prefer your router to be more discreet. Because they have differing network capabilities, their backsides have slightly different options for networking ports. The AX12 provides four Gigabit Ethernet LAN ports, a WAN port, and a 5-Gig port. The AX8 provides five Ethernet ports, a far more common layout. Otherwise, both the NETGEAR Nighthawk AX8 and the AX12 have an almost identical layout. It includes a power button, a reset button, and a pair of USB ports. The ports are well labeled and partially color-coded, which makes the physical setup process for either router very simple. Assuming you’re not both illiterate and colorblind, but even then, NETGEAR has setup videos. Both the AX8 and AX12 use a Smart Connect feature to select the Wi-Fi band most appropriate for any given device on your network, depending on its current location. Both the AX8 and AX12 support Wi-Fi 6, the latest standard, which allows them to enjoy far greater bandwidth capabilities. Keep in mind, these standards tend to get updated fairly infrequently, and Wi-Fi 6 is intended to be able to handle many future generations of networking equipment. The NETGEAR AX-Series of Wi-Fi equipment operates with orthogonal frequency division and multiple access (ODFMA), which greatly expands network capacity and while simultaneously reducing network latency. 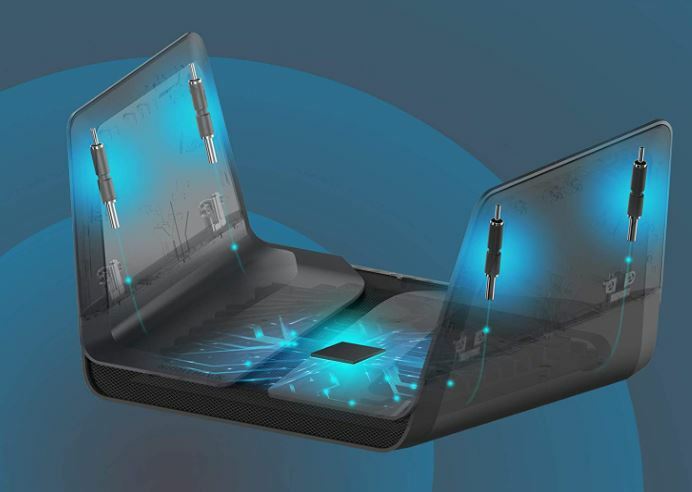 In practical application, these technologies are really about speeding up household devices. 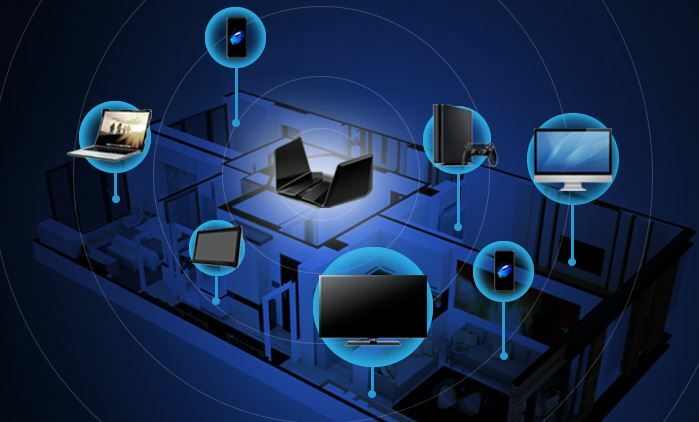 When you’ve got half-a-dozen smart home devices each making their own wireless connection, this kind of thing can make a big difference. Their bandwidth is spread across four connections on the 2.4 GHz band and eight on the 5 GHz band. If you imagine the router is like a pipeline, this basically means these Nighthawk AX8 and AX12 routers are built to use several large pipes. And dispersing the data coming out of those pipes is possible with the help of eight high-performance antennas. Consequently, both the AX8 and AX12 are capable of creating a wider range of wireless dispersal than most ordinary home routers. But a single router in a single location can only do so much. The AX8 and AX12 are appropriate for larger homes, even spaces in the neighborhood of 5,000 square feet. But if you expect to eliminate Wi-Fi dead zones entirely, depending on your layout, it’s likely you’ll need to add a mesh router to totally complete your network. Both make use of 1024-QAM, which translates to about a quarter greater data efficiency and faster speeds than a 256-QAM router. Because the AX12 is intended to handle more data than the AX8, it makes use of a truly impressive 2.2 GHz quad core processor. The AX8 makes use of a similar but clearly weaker 1.8 GHz processor. Either is ideal for powering smart home apps, 4K streaming, and lossless gaming. Again, they were designed relative to intended throughput. This hardware was not specifically tuned for the purposes of gaming. But it’s worth noticing that many of these features are identical to what you’d expect of a gaming router because they’re so heavily performance-based. People keep placing more and more devices on their wireless networks. Under so much strain, traditional routers can quickly face considerable levels of network congestion. Which is why many high-end routers make use of a new technology called MI-MIMO. MU-MIMO is essentially a bandwidth prioritization tool. Routers without MU-MIMO require the devices on their network to take turns communicating. With MU-MIMO, instead of interacting with devices on a first-come first-served basis, the router can communicate with several devices on the network simultaneously. The AX12 is built with cutting edge 8×8 MU-MIMO, ideal for people who have several high-bandwidth connections being used on their network. It can create eight independent streams, similar to being able to give eight devices on the network their own private router. 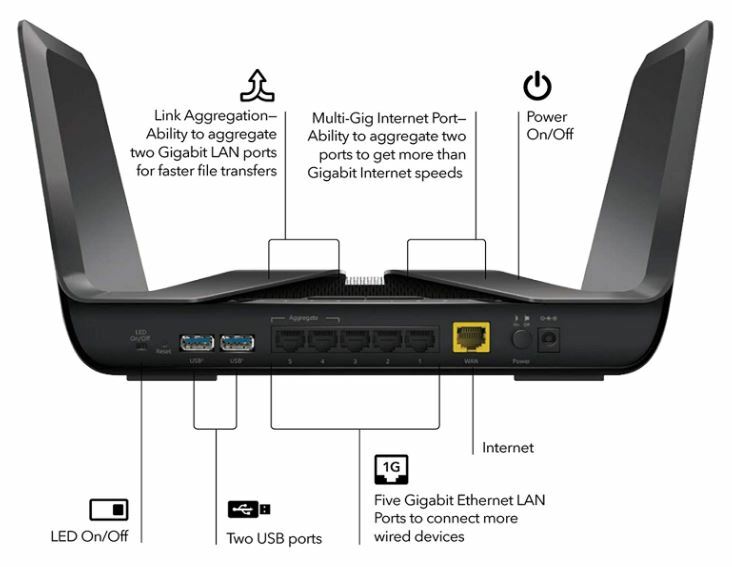 The NETGEAR Nighthawk AX8 offers more standard 4×4 MU-MIMO, which can be similar to setting up four private routers. When you’ve got eight or fewer MU-MIMO devices connected at various ends of a house, it’s a feature that can be nothing short of essential. However, if you’re getting poor bandwidth from your ISP, then MU-MIMO won’t help very much. Additionally, it’s a technology that only works in the 5 GHz band. Which means these connections have to occur with devices that largely have line of sight with the router. Both the AX8 and AX12 are capable of supporting 6Gbps bandwidth, the result of 1200 Mbps on the low-band, and 4800Mbps on high-band streams. However, as mentioned earlier, the way the Nighthawk AX8 and the Nighthawk AX12 go about distributing this data actually differs. 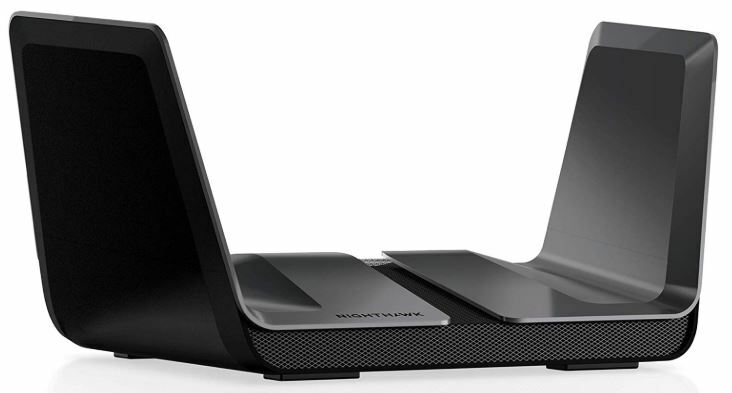 The Nighthawk AX12 is the first time NETGEAR has placed a 5-Gig port onto a router intended for a home. Ports with such capabilities are generally reserved for server-tier equipment. Instead of offering a 5Gig port, the Nighthawk AX8 is built with a more traditional layout, consisting of about half a dozen Gigabit ports. And two of those ports support port aggregation, helping you squeeze out as much as 2Gbps through one line. Both the Nighthawk AX8 and Nighthawk AX12 support WPA3, which is the latest security protocol for wireless Internet connections. It includes improvements for password protection, encryption, and a handful of other security benefits. Perhaps more importantly, both the AX8 and AX12 are made by NETGEAR. NETGEAR provides even their most basic routers with regular security updates. The regularity and automatic nature of this process ensures people remain protected against new threats as they emerge. It’s pretty neat you can get some of the same security features you’d enjoy on a $2,000 piece of server equipment. When you ask your voice assistant a question, and it gives you a lengthy pause before responding, that is often because of network connectivity prioritization issues. Native support for voice assistants has only recently begun to be incorporated into routers. The Nighthawk AX8 and AX12 support Alexa and Google Assistant, and have done an excellent job of integrating both. 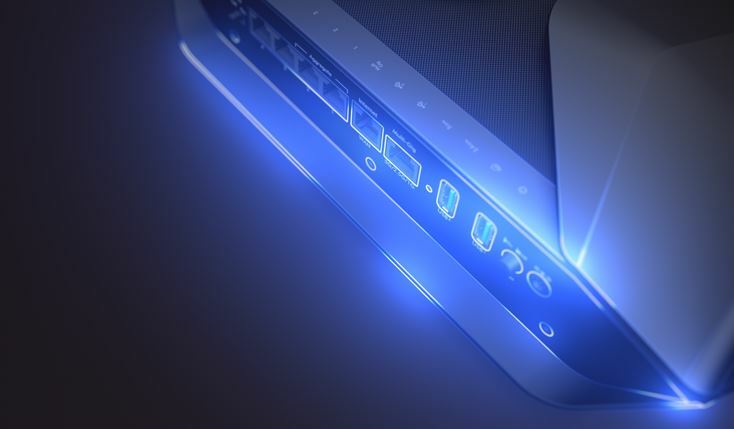 These days, there are actually quite a few companies that make good routers. But there tend to be advantages to going with bigger brands like NETGEAR. One such advantage is they’ve had a long time to fine-tune the support around their products. That’s most exemplified by the free Nighthawk App, which can help you to setup and manage your network. It’s actually great for people who need help setting things up. Both the AX8 and AX12 support all Wi-Fi devices. The Nighthawk series and its connections are backwards comparable with 802.11 a/b/g/n/ac networking equipment. And NETGEAR routers offer wide compatibility with essentially any modern version of Windows, Mac OS, UNIX, and even Linux. For whatever reason, home routers are not often designed to be mounted on the wall. These Nighthawk routers are no exception. The Nighthawk AX8 and Nighthawk AX12 both include a short Ethernet cable, and a one-year warranty from NETGEAR. Who Should Choose the NETGEAR Nighthawk AX8 or AX12? Both the Nighthawk AX8 and Nighthawk AX12 offer futureproofing. They have the bandwidth capabilities to handle huge quantities of data, and support forward-looking network protocols. Both are intended to be of service for years to come. And both can help create a network capable of smoothly accommodating many people and many devices. The NETGEAR Nighthawk AX8 puts to shame virtually any ordinary home router. For most people in most circumstances, the AX8 would be just as useful as the AX12. Sharing so many essential features, the AX8 is a powerhouse in its own right. And that makes it an excellent choice for someone who wants a top-shelf home router, but doesn’t plan on having fifteen people using the network. But the NETGEAR Nighthawk AX12 goes above and beyond. The 5-Gig Ethernet port speaks for itself, and doesn’t require any port aggregation. With 8×8 MU-MIMO, the AX12 is capable of accommodating as many as eight bandwidth-intensive connections. For someone with an extremely busy network, the AX12 is worth careful consideration.